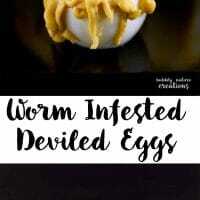 This post for Worm Infested Deviled Eggs is sponsored, but all opinions are my own! Cut the top 1/3 of the eggs off and cut the bottom of the egg slightly to make them level for standing up. Take all yolks out and place in a medium sized bowl. Add the rest of the ingredients to the yolks and mix into a smooth paste. Put the egg yolk mixture into a sturdy plastic bag or a piping bag with a small hole for piping. Pipe worms into the cavities in the bottom of the eggs and going out the sides. Place the tops on the eggs and add a few more worms going up the sides. Enjoy!